2015 is the year for Video Marketing! Video is the fastest growing form of digital content today, and video marketing has revolutionized the way brands and users communicate with each other. Micro videos apps such as Vine and Instagram video have changed the digital advertising language and portfolio. Research shows that 46% of users take some action after viewing a video ad. An average user spends 80% more time on a video ad than a normal ad. Video marketing drives brand awareness and is the most effective way to engage with your target audience. According to eMarketer, the total video ad spending in the US will reach up to $8 Billion by 2016. Video marketing can drive the brand’s ROI up to 80%. Adding to this digital evolution are native video ads. Native video ads are least ignored and are re-shared by 3 out of 6 users on average. They are content based and are integrated completely within the user’s natural browsing experience. Consumers are always hungry for rich content. Video in native ad format provides exactly what the consumer needs. As mobile advertising rises; mobile video advertising has seen a massive jump along with it. 92% of mobile users share a video ad if they stumble upon one while browsing. Brand marketers have realized the power of content distribution if ads are in video format. Brands are getting smarter and incorporating video marketing to effectively build relationships and drive brand awareness with their target consumers. Retail and Automotive industry are the top 2 leading industries in terms of video ad spending as of 2015. 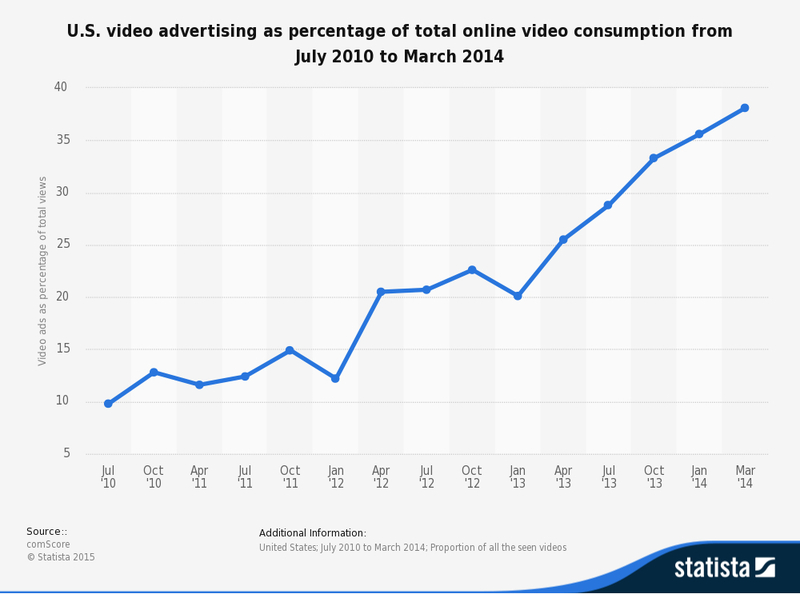 Below, the Statista chart depicts the percentage consumption of online video advertising in US from 2010 to 2014. About 38% of videos viewed by consumers have been video ads. In 2013 online video ads reached 50% of the US population. To know more about how we can help you develop a concise Native Video Advertising Strategy connect with us @ www.connatix.com or simply leave a comment and we will get back to you!